The three and four year old Cross Training class had a special visitor come and teach them about life in Guatemala Sunday! 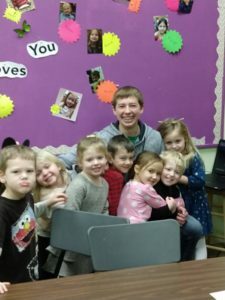 Austin Mills is a current Coe College student who recently returned from a missions trip to Guatemala. After sharing about the trip in both services Sunday, he made a special stop in the preschool classroom.